To understand how a new generation of wireless technology can deleteriously impact weather forecasting, it helps to take a look at exactly what powers the weather, and what these satellites are looking at. Our weather is largely the result of differences between air masses. Pressure, temperature, and moisture, each determined by energy inputs from the Sun, all team up in a complex manner to determine where and when clouds will form and which direction the winds will come from. Remotely sensing these differences is the key to accurately forecasting the weather. Everything on Earth – the plants, the soil, the surface water, and particularly the gases in the atmosphere – both absorb and, to a lesser degree, emit microwave radiation. Measuring those signals from space is the business of satellites carrying microwave radiometers, essentially sensitive radio receivers tuned to microwave frequencies. By looking at the signals received at different wavelengths, and by adding in information about the polarization of the signal, microwave radiometry can tell us what’s going on within a vertical column of the atmosphere. For water vapor, 23.8-GHz turns out to be very useful, and very much in danger of picking up interference from 5G, which will use frequencies very close to that. Since microwave radiometers are passive receivers, they’ll see pretty much everything that emits microwave signals in that range, like the thousands of cell sites that will be needed to support a full 5G rollout. Losing faint but reliable water vapor signals in a sea of 5G noise is the essential problem facing weather forecasters, and it’s one they’ve faced before. At the 2019 annual meeting of the American Meteorological Society, Sidharth Misra, a research engineer at NASA’s Jet Propulsion Laboratory, presented data showing how commercial enterprises can have unintended consequences on the scientific community. Between 2004 and 2007, satellite-based microwave radiometers detected an increase in noise in a curious arc across the top of the United States. A similar signal was detected by another satellite, with the addition of huge signals being returned from the waters off each coast and the Great Lakes. The signals turned out to be reflections from geosynchronous direct TV satellites, bouncing off the surface and swamping the water vapor signals the weather satellites were trying to measure. But surely the scientists are overreacting, right? Can losing one piece of data from as complex a puzzle as weather prediction really have that much of an impact? Probably yes. The water vapor data returned by microwave radiometers like the Advanced Microwave Sounding Unit (AMSU) aboard a number of weather satellites is estimated to reduce the error of weather forecasts by 17%, the largest contributor by far among a group of dozens of other modalities. The loss of microwave water vapor data could have catastrophic real-world consequences. In late October of 2012, as Hurricane Sandy barreled up the East coast of the United States, forecasts showed that the storm would take a late turn to the northwest and make landfall in New Jersey. An analysis of the forecast if the microwave radiometer data had not been available showed the storm continuing in a wide arc and coming ashore in the Gulf of Maine. The availability of ASMU data five days in advance of the storm’s landfall bought civil authorities the time needed to prepare, and probably reduced the casualties caused by the “Storm of the Century”, still the deadliest storm of the 2012 season. 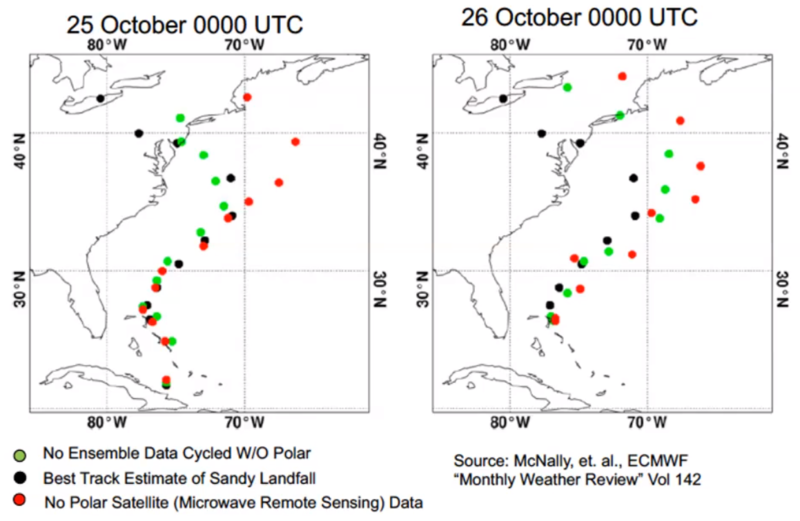 Superstorm Sandy would have been predicted to track into the Gulf of Maine (red) without microwave water vapor data. It actually landed in New Jersey, as predicted five days out with the satellite data (black). Will the 5G rollout negatively impact weather forecasts? It’s not clear. Licensees are required to limit out-of-band emissions, but with so many 5G sites needed to cover the intended service areas, and with the critical 23.8-GHz water vapor frequency so close to the UMFUS band, there’s not much room for error. And once the 5G cat is out of the bag, it’ll be difficult to protect that crucial slice of the microwave spectrum. Whatever happens, it doesn’t look good for weather forecasting. The UMFUS auction proceeds apace, and has raised almost $2 billion so far. Companies willing to spend that much on spectrum will certainly do whatever it takes to realize their investment, and in the end, not only will science likely suffer, but lives may be put at risk for the sake of 5G as our toolset for predicting dangerous weather faces this new data-gathering challenge.